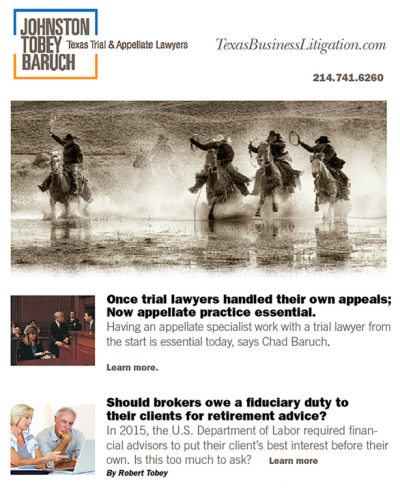 Johnston Tobey Baruch publishes an e-newsletter. Our attorneys use the newsletter to offer solutions to a number of ethical and professional malpractice problems and issues. We have expanded the discussion to include business and fiduciary litigation and the general state of the legal profession. If you receive the publication and decide it isn’t for you, there will be ample opportunity to unsubscribe. We promise to maintain your privacy and follow your wishes. Submit your email to subscribe today.